Three consortia have been shortlisted to go to the next stage of the tender process to design and construct the $2bn Forrestfield-Airport Link. Each will be issued with a Request for Proposal for the project that includes 8km long twin tube tunnels. Forrestfield Connect (ACCIONA Infrastructure, BAM International and Ferrovial Agroman). Transport Minister Dean Nalder said that the Public Transport Authority (PTA) evaluated five proposals. 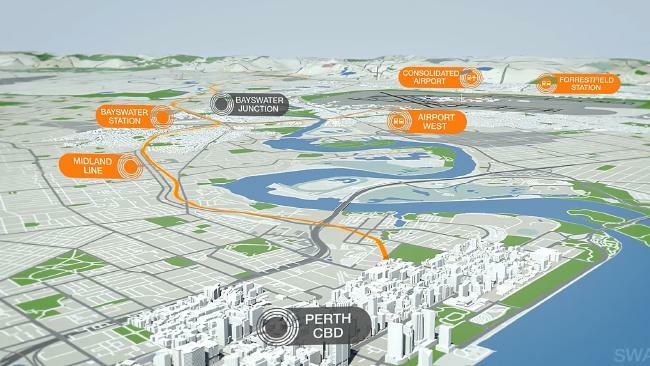 “The level of interest in designing and constructing this transformational rail line to Perth’s foothills via the Perth Airport has been high,” Mr Nalder said. The PTA will now issue a formal RFP to the three short-listed proponents to develop fully costed proposals. The 8.5 kilometre rail extension branches off the Midland Line, just east of Bayswater Station. It will feature three stations, Airport West, Consolidated Airport and Forrestfield. A contract will be awarded to the successful bidder in mid-2016 with detailed design to begin soon after and construction starting in late 2016. The first train will operate along the line in 2020.